Okay, despite what the name of this blog and what the About page says, the 14,000th Phillies card has not officially been added to the collection. When it comes in (I am expecting another 20 cards in the mail over the next few days), it will of course be immortalized in its own post. In the meantime, I did start prepping the site in anticipation of the big event. I’ve actually had the idea of doing a blog like this for some time, but it took this particular event to break the inertia. I have no idea how long I will actually continue to update this site, but I intend to post to it for a long time. 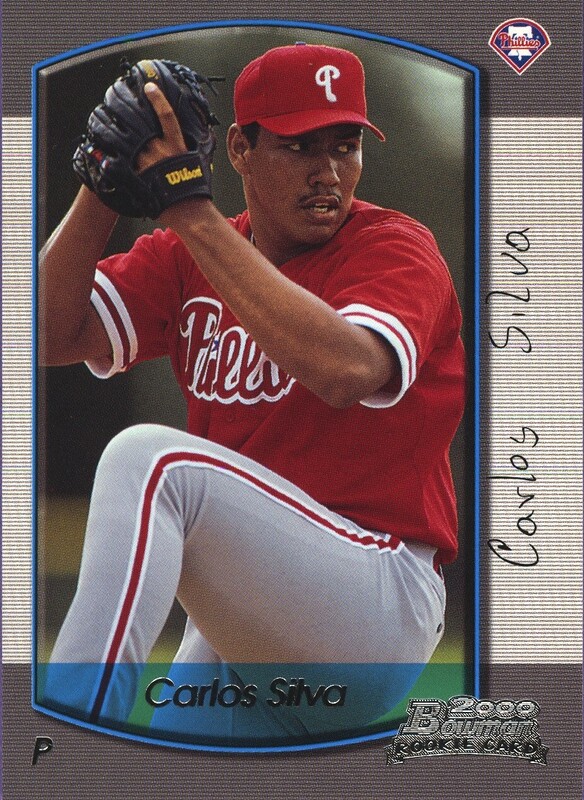 So, in anticipation of number 14,000, here’s one of the many cards that inspired me to start this particular blog: 2000 Bowman Draft Picks & Prospects, #66 Carlos Silva. The thing I loved about this card is the Photoshop job that Topps did on it. On the surface, it was basically a good one because the card was in my collection for years before I finally noticed the error that kept it from being an awesome touch-up: in their haste to Photoshop Silva’s Clearwater Phillies hat into a proper Philadelphia Phillies hat, they somehow reversed the Phillies “P” on the cap. I don’t know how that particular type of mistake takes place (and Topps has made plenty of Photoshop errors over the past 10 years that were far less subtle than this one), but this one has to rate as one of the most puzzling. Hopefully, number 14,000 arrives tomorrow. If not, I’ll highlight another favorite card from the collection tomorrow night.